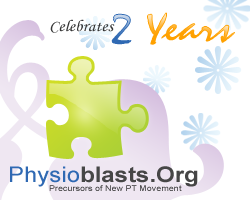 8th July 2006 marks the 2nd anniversary of the presence of Physioblasts.Org on the web. The site first appeared on the internet on 8th July 2004. We have achieved many significant landmarks from that time on that we could be proud of. The site has been continuously growing from the contributions from its members. Thank you all for your continuing participation and support, without you this project wouldn't have come this far.